A Messy Kitchen: The Babes tackle Jachnun... Happy Anniversary! The Babes tackle Jachnun... Happy Anniversary! 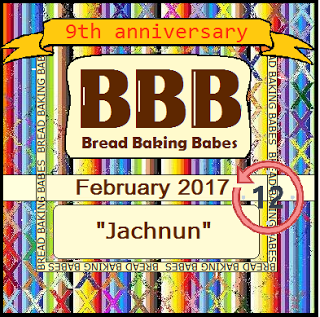 Wow, Lien picked a doozy of a challenge for the Bread Baking Babes' 9th anniversary. 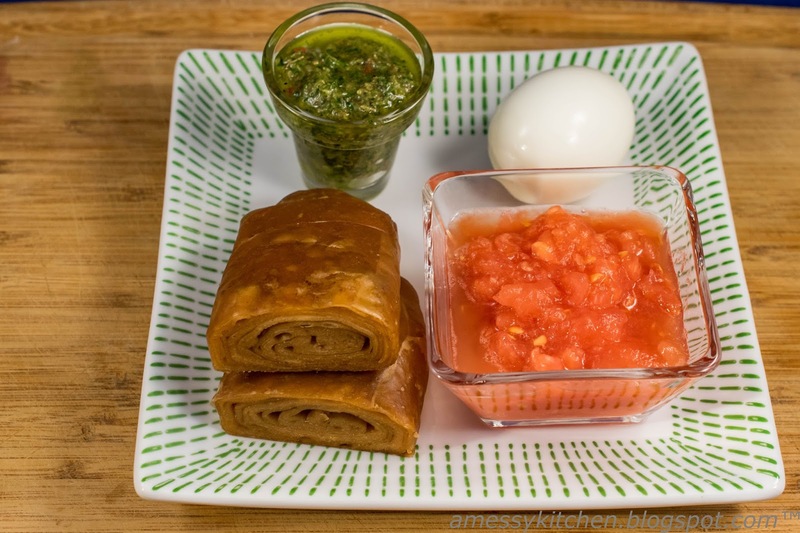 This month we ventured overseas for me and were given the task of baking a traditional Yemenite food, Jachnun. 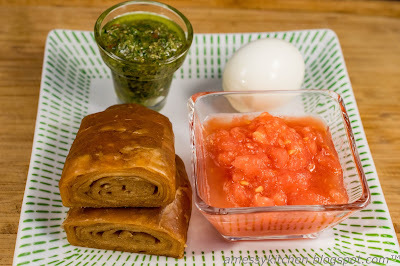 The dish is one of many slow-cooked Jewish foods designed to be prepared a day in advance and baked all night long, so that there can be hot food on the sabbath, when lighting fires is prohibited. It is traditionally served with grated fresh tomato, zhug (a Yemenite hot sauce), and a hard-boiled egg, cooked in the pot along with the dough. I cooked my eggs separately. Jachnun is a barely leavened bread, using just a bit of baking powder. 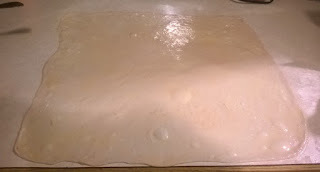 The dough is stretched out paper thin, spread with shortening, oil, or clarified butter, and folded and rolled up. 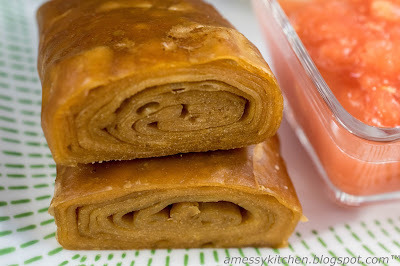 It has a dark amber color and a slightly sweet taste from the date syrup used in the dough. It's a popular item with street vendors, restaurants and even the frozen section of the supermarket. I understand it is supposed to be like filo dough. I did not get mine nearly thin enough and my results were closer to a rolled, thin crepe. One of those, practice, practice items. But it was actually quite good with the sauces. I've never had anything quite like it. I used the traditional clarified butter, and the smell was just wonderful! Not very sweet at all, though I accidentally put a pinch too much salt in the dough, making it end up more savory. I made a half batch, but a full batch would have given me more practice stretching super thin. Here is a video showing the shaping process: https://www.youtube.com/watch?v=Oygxy4i3u30. If you'd like to expand your horizons with this traditional dish, we would be thrilled if you would join us for this month's baking challenge. Check out the host kitchen's post at Notitie van Lien to see the original recipe. You can also check out the posts on the Facebook Group. You have until the 28th of this month to bake and submit a picture or a link to your post to the host kitchen. Then you will receive a Buddy Badge graphic to add to your post and be included in the end of month round up. Remember, this is an overnight bake! Mix the flour, honey, date syrup, baking powder, salt and water together to form a sticky, wet dough and knead for a few minutes. Cover and let rest for 10 minutes to let the gluten relax. Divide the dough in 6 more or less equal pieces, shape them into a ball and leave to rest 10 minutes before the stretching begins. The shaping method requires the dough to be stretched using butter, oil or margarine. Grease the work surface, place one piece of dough on it, grease the top and start working to make it the thinnest possible, while adding more oil/butter regularly. Doing this by hand works best to achieve the thinnest result. A rolling pin will tear the dough and not be thin enough. (This takes a lot of practice. I didn't read closely and wasn't using the butter to facilitate stretching, so mine was still too thick.) 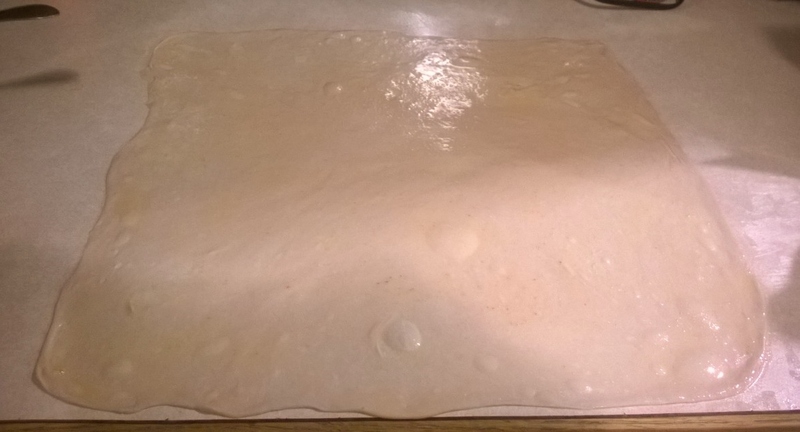 When the dough is very thin (preferably like filo or strudel dough) fold 1/3 of one side over onto the dough, repeat with the other side (like a business letter). You now have a long strip, keep buttering/greasing the top, while you roll – starting at the narrow edge- the dough in a tight cylinder. Stretch and keep it tight as you roll. Place three rolled logs next to each other, crosswise over the strip on the bottom of the pan. Place the other three crosswise on top of the first layer. (I cut a sheet of parchment into strips and set each jachnun into it's own cradle.) Grease or butter a double layer of parchment paper on one side and place on top, greased side down. Now you can place the (raw, uncooked and whole) eggs on top of the parchment paper. (I think some babes tried out one or two eggs this way but mostly opted to boil the eggs separately to avoid a green ring.) Take a double layer of aluminum foil, cover the pot, securing the edges of the pan. Use a lid or a sheet pan to place on top of the foil to keep it tight. Place it on the rack in the oven and bake for 12 hours. (Mine was done at 10-11 hours though not crisped.) To crisp up the top, take lid and parchment paper off and bake in a fan oven for 20 minutes (200ºC/400ºF) or until golden. 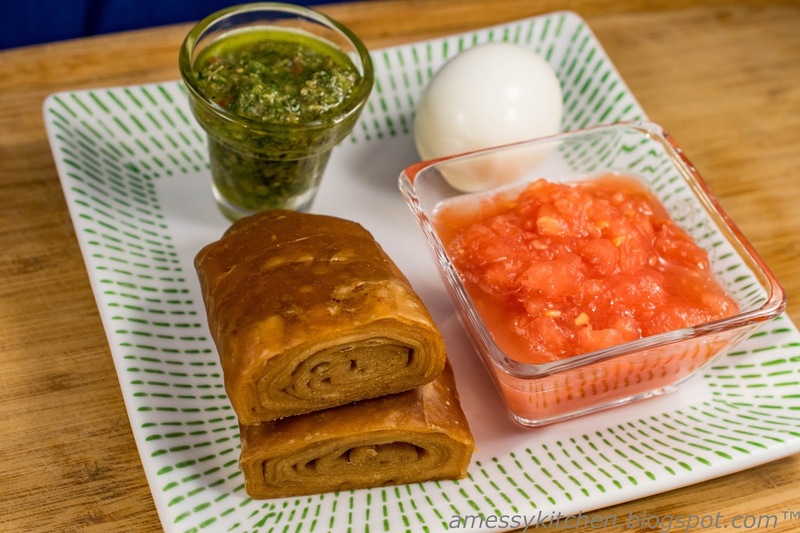 To eat in the morning, take out the pan, place the jachnuns on a plate and arrange with the peeled eggs around them. Serve with grated tomato and Zhug (hot, spicy and garlicky dipping sauce) for breakfast. So this recipe does take some planning ahead. You could also bake when convenient and then just reheat the rolls on a baking sheet to warm through and crisp up a bit. It's not traditional, but it works. Good golly your stretched out dough looks pretty thin and then looks thicker when rolled and baked. This seems to be one that really is influenced by mysterious variables. 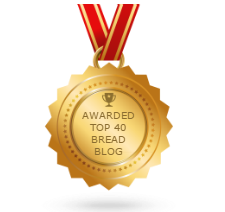 It was an adventure but then baking bread should be. In many ways. Gorn really loved this one and I did too but I really am head overheels in love with the date syrup and Zhug! Happy Anniversary 9 wonderful years. You did a very nice job with this! So many variables! I loved the zhug too. That was my favorite. I laughed out loud when I read "doozy of a challenge". Yes, indeed, it was that! I'm still reeling. But you managed it with flying colours. Look at what a beautiful gold your jachnun are. Kelly, your Jachnun looks beautiful! Love that golden color and you even used clarified butter. How cool is that!